is an online consultation and prescription service. We know how busy life can get and how tough it can be picking up your medication in person. We also know that it isn’t always convenient taking a day off work to see your GP in person. Here at Treated.com, we strive to make everyday healthcare more convenient. Since our launch in February 2015, we've helped thousands of patients get the prescription treatment they need delivered directly to their home or place of work, within just 24 hours. Our offices are based in Bolton, Lancashire, and our pharmacy is registered with the CQC, GPhC and MHRA. Qualified at the University of Southampton Medical School (1999). Became a GP in 2004. Has supervised GPs in training and has extensive experience in clinical governance, and in safeguarding children and vulnerable adults. Daniel monitors the doctors who prescribe for Treated.com to check that we are only supplying medicines that are safe for patients, and to ensure that the doctors who work on our team have the right training and experience. He works closely with our team of pharmacists and dispensers to ensure that you get the medicines you've requested and that they're safe for you to take. Qualified at the University of Southampton Medical School in 1999. Dr Adele Farrell is the Principal GP at an NHS GP surgery in Southport in Merseyside, where she works three days per week seeing patients, and one day per week concentrating on practice management. Prior to this role, she spent six years working in paediatric A&E. Adele works as a prescriber for Treated.com, reviewing prescription requests from patients to ensure that they suitable and safe, and responding to patient queries. She works closely with Clinical Director Dr Atkinson to help monitor and improve Treated.com's online prescribing processes. Graduated from University of Manchester in 2014 in Pharmacy. Qualified in 2015 after 1-year pre-registration training. Sanjeda has worked across a number community and commercial pharmacies as a locum. She has been working regularly as a pharmacist for Treated.com since 2017, assisting the Superintendent Pharmacist in monitoring processes and ensuring standard operating procedures are being followed. Sanjeda works closely with the pharmacy and clinical team to ensure patient safety and oversee the day-to-day running of the dispensary. Adam has worked for Treated.com since 2014, overseeing the production of all English content published on Treated.com. He and the content team work in conjunction with the clinical and pharmacy team to ensure that all user-facing material on the Treated.com site is accurate, kept up to date, and written in line with Editorial Policy. His team also regularly work with health organisations and charities to produce articles for the Treated.com blog. The get treated.com TV campaign. In February 2016, after one year of being live, we wanted to raise awareness of the service we offer to patients. So our team got together with design agency Young to develop our very own TV commercial, starring 'Dan'. 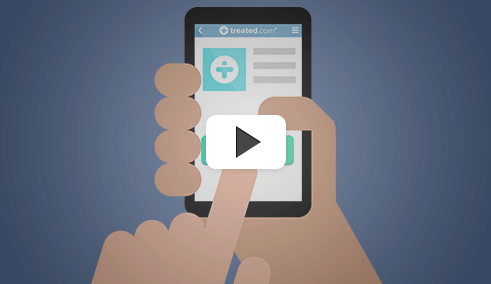 Debuting on several channels in March 2016, the get treated.com TV commercial was among the first for an online pharmacy service to be aired on UK television. 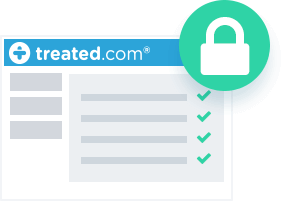 When you use Treated.com, you don't need to wait for an appointment to see a doctor, or queue up at your high street chemist to get your regular treatment. And you don’t need to go through any complicated processes to get your prescription renewed. Our all-inclusive service is specifically designed to help patients get treated safely and conveniently. Easy process - Simply complete a consultation, and our qualified team will take care of your request. All inclusive pricing - No hidden costs - the price displayed is the price you pay. 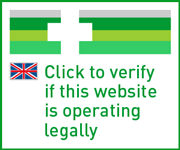 Your safety and privacy are our priority - We’re registered with independent UK health regulators. Attention to your needs - You’ll get regular updates on your order, and our customer care team is on hand to help. When you’ve found the treatment you need, simply fill in our online questionnaire to start your consultation.One of our GMC-registered doctors will review your request, and once they have approved your order, issue a prescription for you.This is then sent directly to our UK pharmacy, who will dispense your medicine. Treatments are shipped using tracked,next-day delivery. In most cases, you’ll receive your order within one working day after placing it. When you create an account, reordering is simple through the panel in your patient area. Or, you can order as a guest if you prefer. You can read more on our process on our FAQ page. We regularly review our prices to ensure we remain competitive, and we won’t ever spring any hidden or unexpected costs on you. 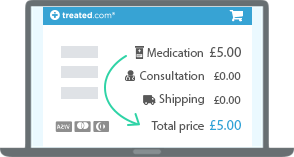 The price you see listed next to your medicine on our site is the total price you pay. This includes the cost of the medicine itself, doctor consultation, and next-day delivery. Your safety and privacy is our priority. We work with GMC-registered prescribers, and our service is regulated by the General Pharmaceutical Council (GPhC), the Medicines and Healthcare Products Regulatory Agency (MHRA) and the Care Quality Commission (CQC). Medicines are shipped in secure, unmarked packaging to ensure confidentiality. All information you provide to us is kept safe and secure, and handled in compliance with data protection guidelines. Read more on how we handle your data. We pride ourselves on providing the very best customer care possible, which is why our patients have rated our service as excellent on TrustPilot. From placing your order to having it delivered, we’ll keep you regularly updated with the progress of your order. We’ll also send you a reminder when your medicine is due to run out. If you have any questions about your treatment, you can get in touch with our doctor or our pharmacy team through the secure messaging facility in your patient area. You can also reach our customer care team via telephone or email. Sign up online or call us - Setting up an account with us is quick and easy. You can do this over the phone, on our website or through our app. We’ll do the work for you - Tell us the name of your GP surgery and we’ll request your prescription from them on your behalf. Dispensing and free delivery - Our UK pharmacy will dispense your medicine, and send it to you by Royal Mail. Reminders when your prescription is due - Set up reminders so that you can place a repeat order before you run out. You choose how you want to manage your repeat prescriptions. If you prefer to do it online, you can sign up through our website and handle repeat orders via your unique user profile. Alternatively, download our app to make reordering your prescriptions even quicker and easier. Our customer care team are just a couple of clicks away, and on hand to provide any assistance you need. Or, if you prefer to renew your prescriptions over the phone, that’s easy with our service too: just give us a call on 08000 932 932. Once your profile is set up and you’ve told us who your GP is, we’ll contact them and request your prescription for you whenever you place an order. We use the NHS Electronic Prescription Service (EPS), so you won’t need to wait for your paper prescription to reach us in the post. Once approved, the e-prescription from your GP will come straight through to our pharmacy. Our UK pharmacy will then dispense your NHS prescription for you, and then send your treatment via the method you have chosen. Royal Mail standard delivery is free, but if you need your medicine tomorrow, you can pay £4 extra to have it sent by special next-day delivery. All orders are shipped in plain, secure packaging, to help ensure your privacy. Our simple-to-use reminder service means that you don’t ever have to run out of your repeat medication again. When your prescription is due for renewal or you’re running low on your regular medicine, we’ll let you know via email, SMS or both (whichever method you choose) to remind you to reorder. 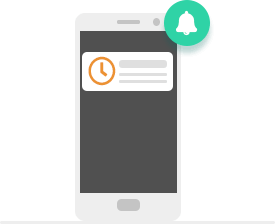 App users can also set up notifications on their smartphone. Choose your own appointment time - From 6am to 11pm, 7 days a week. We work around your timetable. Consult with a UK doctor - Receive professional medical advice from one of our GMC-registered doctors via our secure video chat. Get the treatment you need - Our doctors are able to issue a prescription where appropriate, or refer you to a specialist if necessary. Select where your prescription is sent to - Have your prescription sent to your local pharmacy, or let our pharmacy take care of it for you. We know that not everyone can afford to take the whole morning or afternoon off work for a 10 minute appointment. Our video service enables you to select a time that suits you, so you can speak with our doctor at your own convenience. Appointments are available from 6am until 11pm, 7 days a week. Every doctor we work with is registered with the General Medical Council in the UK. When you consult with them, you’ll do so through a secure video connection. The details of your consultation will always be kept confidential, and handled in accordance with data protection guidelines. After booking your appointment, you’ll be given a short questionnaire to complete. You don’t have to fill this in, but it helps to save time during your consultation if you do, and helps our doctor to prepare. Based on the outcome of your consultation, our doctor may advise on treatment where appropriate, and can issue an e-prescription. In other cases, they may recommend further consultation with a specialist, and will be able to make a referral. Our doctors can also issue a fit note where necessary. There are small extra costs for prescriptions, referrals and fit notes, but when you use our service, you don’t have to agree to any of these upfront. Following consultation, you choose what level of service you require from us, and what you pay for. Where your doctor recommends prescription treatment, you can decide where they send your e-prescription to be dispensed. You can choose a pharmacy near you, so you can pick up your medicine in person; or you can nominate our UK pharmacy to handle it for you. Our pharmacy is based in the UK and registered with the GPhC and CQC. We ship most medications by special courier, so you can expect to receive your medication in one working day. Collect your sample at home - All the test kits available from us enable you to collect your sample at home, without visiting a clinic in person. Secure and confidential - Your data and results will be handled with the utmost care, and in accordance with GDPR guidelines. Get accurate results - We only provide test kits with a high level of accuracy. Reliable health advice - Our doctors are available to provide advice based on your test result where required, and help you get the treatment you need. Our home test kits come with everything you need to provide your sample at home, at your own convenience, without having to go to the clinic or book an appointment. Each kit contains detailed and easy to follow directions, to help you ensure that the test is as accurate as possible. If your test sample needs to be sent to our partner lab for analysis, you’ll be supplied with a freepost envelope and instructions on how to post it to them. Any information you give us is kept secure, and we won’t share your details with anyone unless you agree to us doing so. If you have taken a lab test, we’ll post your result securely to your patient area, and notify you via email, SMS, or both (whichever you prefer) that your test is ready. For extra security, we’ll always ask you to login (or verify your identity) before giving you your result. We only supply test kits with a minimum accuracy rate of 99% when used perfectly. 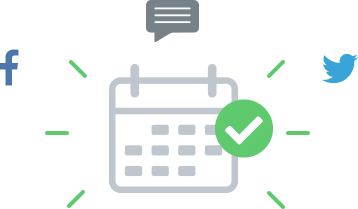 Some of the test kits we offer enable you to get your result in minutes; whereas others require analysis from one of our partner labs. We only work with reputable pathology services, to help us ensure that the tests we offer are as accurate as possible. We’re here to help if your test result indicates that you need treatment. Our doctors can provide advice and signpost you to the right services where necessary. Where possible, they can also direct you to the appropriate treatment on our site, and issue a prescription. Each week, you can find helpful and interesting articles on a range of health-related subjects on our blog. Several of our studies have been published by several major press outlets, including Huffington Post, Mail Online and the BBC. You can also get Treated.com on Twitter and Facebook for all the latest updates on our service, and goings on in the healthcare industry. Try our FAQ page or get in touch with our customer care team on 0207 0430 716. Treated.com is rated 9.5 out of 10 by 1740 customers on TrustPilot! Very easy to use website. Prompt responses and very quick delivery! Great service!